Bat and Robin. The dynamic duo. Mammal and fowl together in the skies, fighting crime. This is the kind of shirt that I find to be clever and clean and everyone ‘gets it.’ The only thing I cannot figure out is where they found belts that small so as to fit a bat and a robin. And how about Robin’s goggles. Where’d they get those. 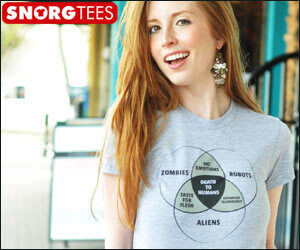 Anyways, this shirt would be loved by all, especially children. Won’t get you sent home by wearing this one to school! 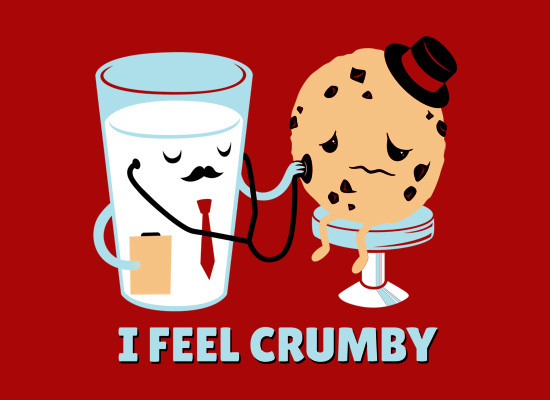 I feel crumby but I guess I will be spending my life as a cookie. Dr. Milk says I will always be crumby and will even be a little gooey when it gets hot and humid. If I jump into a glass of milk, I will dissolve but I know that either way, I will taste delicious. If you microwave me, please don’t do let it go for more than about 10-15 seconds because I will be come hard and brittle. Dr. Milk, we are such a match. We simply go together so please stay with me or I fear that I will simply be crumby forever.